Go to the above website (RIKEN Harima Safety Center) and follow the procedures for “SPring-8/SACLA users who are not affiliated with RIKEN”. Please fill in the period which you will be registering as radiation workers in your home institution (Generally, from April 1 through March 31). Write the last day of the fiscal year (March 31) if you plan to carry out an experiment even if your proposal for the second half has not yet been approved as of the submission of application. Please note that the end of Approval period cannot be set up to next fiscal year. No, there is no such concept. Registered radiation workers are allowed to enter the area during the Approval period. After the registered Approval period, they are not allowed to enter the area. To use SPring-8/SACLA, users must be qualified as radiation workers at their home institution. If your home institution has no radiation protection supervisor or provides no radiation safety training, take radiation safety training provided by an external institution to meet the requirements of the ionizing radiation health checkup, radiation safety training, the possession of a dosimeter, etc. Not yet. The registration procedures are not completed simply by filling out the form on the website. Confirm the content on a PDF form created online, print the form, have the head of your institution and the radiation protection supervisor sign and seal the form, and submit the form to the SPring-8/SACLA Users Office, JASRI, by post (with all the required documents). The PDF form once created cannot be corrected. Restart the application procedures and create a new PDF form. The incorrect application form will be confirmed and deleted by the RIKEN Harima Safety Center. Immediately contact the SPring-8/SACLA Users Office, JASRI (email, uoffice@spring8.or.jp; TEL, 81-791-58-0902). From FY2014, the original copy of the application form is also required for users affiliated with overseas institutions. Submit the original form by post and ensure that it arrives at least 10 days before the visit. Users affiliated with overseas institutions can provide a signature instead of a seal. Immediately contact the SPring-8/SACLA Users Office, JASRI (email, uoffice@spring8.or.jp; TEL, 81-791-58-0902) and report the receipt number on the upper right of the application form. Minor errors can be corrected when you visit SPring-8. Fill out the Affiliation and Other Changes Notification Form (online) and submit it following the same procedure for the registration of radiation workers. 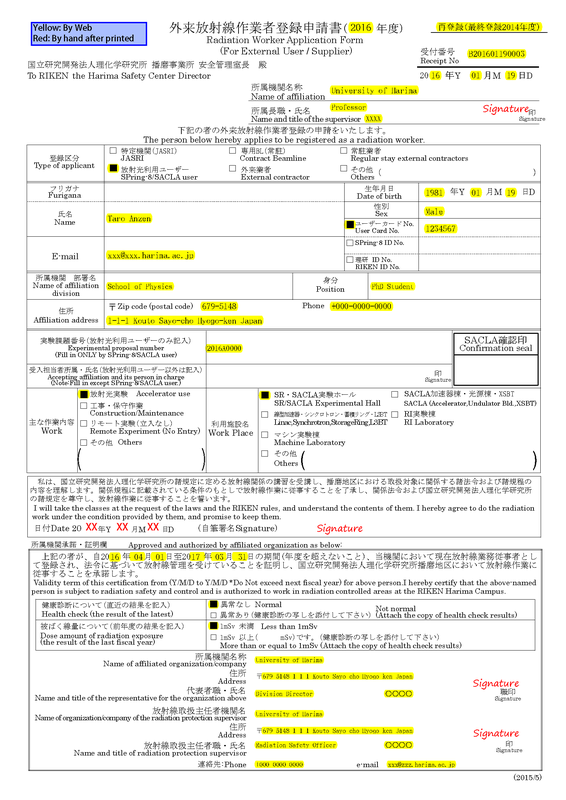 The items covered in this form are the applicant’s name and email address, the name and address of the division of the affiliation. If you become affiliated with another institution, fill out the Radiation Worker Registration Cancellation Form (online) and submit the form by post. To continue to be registered as a radiation worker, apply again for registration as a user affiliated with your new institution. Also click here. Submit a new application (DO NOT use the Affiliation and Other Changes Notification Form). Applications extending beyond the next fiscal year are not acceptable. If you are a user registered for April 2014 or later, first fill out the Radiation Worker Registration Cancellation Form (online) and submit the form by post. Next, fill out the Radiation Worker Application Form for External Users (online) as a new user and submit the form by post. Also update the user registration. No, you need not do so. However, if you fall under a different radiation control system as a result of the transfer even within the same institution, you must submit the Radiation Worker Registration Cancellation Form and make a new application. Notice is sent to the radiation protection supervisor only for the month when a radiation worker enters the radiation-controlled area of SPring-8/SACLA. Notice is sent to the radiation protection supervisor. If he/she is not affiliated with the applicant’s home institution, notice is sent to the representative of the applicant’s home institution. Contact the following front desk. An application submitted by an agent with permission from the applicant is acceptable. A sample can be accessed on the upper right of the entry screen. Refer to the example for SPring-8/SACLA users. Also click here. As before, take radiation safety training and ionizing radiation health checkup at your home institution following relevant laws and regulations. You do not have to provide the dates on the new form, on which the radiation protection supervisor certifies that the user is subject to radiation safety control. It is desirable to provide all relevant proposal numbers, but only one number is also acceptable. You do not have to apply for registration from all institutions. Apply for registration as a user affiliated with the institution that oversees your radiation safety (in general, the main institution for which you work as a radiation worker). The head of the affiliated institution is the head of the department, division, or section with which the applicant is affiliated (e.g., laboratory head). The representative is the person who has the right of human affairs for the applicant (e.g., the Dean). Provide the name of the head of your home institution (e.g., the President) or the person who has the right of human affairs (e.g., the Dean). Only the signature of the radiation protection supervisor, who is responsible for managing and ensuring records of your radiation dose history, is valid. Yes, it is acceptable. Typed name and address are also acceptable. Where on the printed form should I sign and seal? Refer to the sample . You can take radiation safety training by e-learning system from March 1st, 2019. Please click here for more detail. Should I make a reservation for radiation safety training using the “Reservation request for radiation training (new)” form on the website for creating the application form? Users should make a reservation for radiation safety training by submitting the application form. What are the changes in procedures for the registration of radiation workers in FY2014? The procedures for the registration of radiation workers were changed from PDF data entry to website data entry. Applicants are required to enter the necessary information online, create a PDF form, print and fill out the form, sign and seal it, and submit the form to the SPring-8/SACLA Users Office, JASRI, by post. The previous form is not available for users planning to visit SPring-8 on April 1, 2014 or later. Create an application form on the website. It is acceptable until the end of July 2014. However, for applications submitted in August or later (including the application for a work period in August or later), only the signature of the radiation protection supervisor is valid.